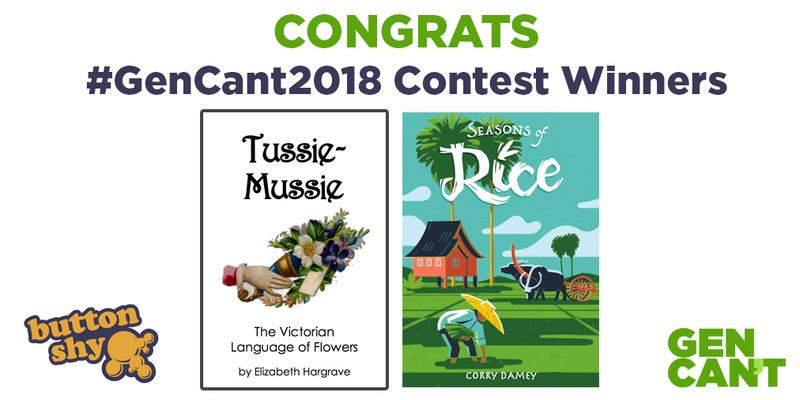 #GenCant2018 Game Design Contest – WINNER! 468 is the number of sleeves used during play testing the wide variety of submissions to our #WalletGame contest, co-hosted by the fabulous Button Shy games. Thank you to all of the creative hard working game designers who submitted games. The diversity of themes and mechanisms impressed us and showcased how flexible the 18-card format is. Yes, there was a lot of work involved in judging (thank goodness for paper cutters.) But there was a lot of fun involved in trying all these new games too. I have no doubt that Button Shy will be pursuing a number of submissions for future publication. For GenCant, specifically, we realized that games that had family-friendly themes and player count options were rising to the top. We were most enjoying games that had interesting game play and decisions but weren’t too complex. Two games rose to be the clear top contenders. Ultimately, we realized that by offering both to GenCanters, we hit a sweet spot in terms of player count options along with the bonus of a choice of theme and mechanisms. We hope you enjoy these games as much as we do! To download print-and-play files, please visit the contest page on Button Shy’s website. Congrats Elizabeth and Corry. Your games will bring a lot of people a bunch of fun. Tussie Mussie charmed us with its theme and flavor text – and won us over with the I-Divide-You-Decide mechanism at its core. Bonus is that it features a snappy solo play mode! Seasons of Rice is one of the most polished games we saw… but more importantly we had so much fun playing it. The scoring goals added some variability and the puzzle of laying out the cards was entertaining… a really well balanced 2-player experience. Thank you, again, to everyone who worked so hard to submit a game. I’m certainly going to try these out in a few days. Are these going to be published? Not just pnp? Congrats to the winners! These look amazing! Congrats to the winners. Will we have access to the PNP for the other entries? Some of the designers have offered them up for PnP. I’m not sure I’ll have time to collect those in a post here… your best bet is to look at the GenCant twitter feed where I’m retweeting the ones shared. It’s worth a look – picking winners wasn’t easy. There were a lot of solid games submitted! I’ll be printing these out today. They look great! Congratulations to the designers! Where can we find the files to print and play?